Areas which seem free of overhead lines are generally using underground cable network for the electrical distribution. A distribution system can also have a hybrid setup of overhead and underground lines to efficiently distribute the electricity. Underground distribution systems have prevailed as twenty first century’s urban distribution systems. Developed nations and areas are constantly shifting to underground cable system for more tidy and clean transfer of electricity from substations to homes and industrial setups. In addition to providing cleaner landscapes, underground supply system remains unaffected by the weather and other environmental hazards. 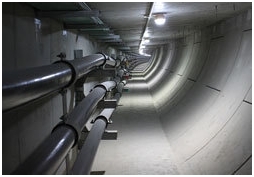 However, as every picture has its two sides, underground distribution system comes with its own pros and cons and different aspects will be discussed in this article. A typical 66KV overhead single circuit transmission line costs 0.28 million dollar per mile contrary to 1.5 million dollar per mile for its underground substitute. Underground distribution cable installation and final operation usually costs 4 to 10 times more. Right of way (ROW) also costs more for the underground network rather than the underground one. Operation of underground electrical lines is usually maintenance free if correct design and XLPE (cross linked polyethylene) is used. Oil filled cables are cheap but any leak along the line may cause excessive leakage and need for extensive repair. Underground transmission and distribution lines offer longer effective life and reduced maintenance costs over the life of its operation. Operational impacts of underground distribution network are much different than those of overhead ones due to the physical differences. Underground transmission lines are more favorable as they reduce the transient faults completely. EMF hazard is reduced to optimum and safe levels due to huge volume of landmass over the underground cables. Aesthetic look of the area is not affected considerably. Property values are not undermined due to visible infrastructure in the vicinity. Public hazard of electrocution is mitigated. Arcs, flashes and short circuits of underground lines do not pose any threat above the ground. It is practically very difficult to find the fault in a transmission line which is underground. More nondestructive and noninvasive technologies are used to detect the faults (although they occur rarely). Up gradation is very difficult and costs almost the same amount as to commission an entirely new line altogether. Repair of cables is more time consuming and need complex interventions increasing the maintenance cost further. Heavy duty conductor for the transfer of electrical power. Insulating system (XLPEs more commonly). 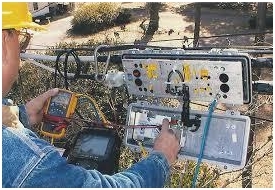 or copy this trackback: http://engineering.electrical-equipment.org/electrical-distribution/introduction-to-underground-distribution-system-mv-lv.html/trackback from your own site.